Perfectly reflective gray morning panorama at Rere Bay anchorage, Whangaroa New Zealand. 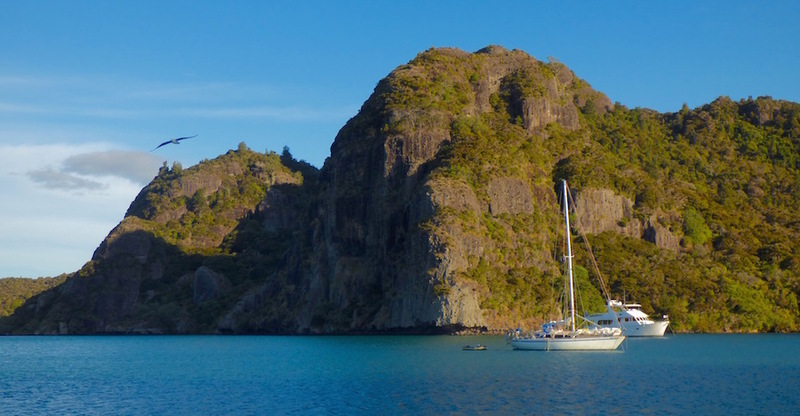 While Fatu Hiva, French Polynesia still wins my prize for the most gobsmakingly awesome rock formations I've ever seen, Whangaroa's not too shabby in that department for New Zealand. 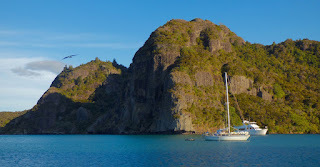 Whangaroa was part of our continued escape from the Kiwi cruising Bay of Island holiday hordes. Other than nice scenery, we weren't too sure what to expect. this poster in the ladies bathroom implies otherwise. We stopped first at Kingfish Lodge, where we grabbed a mooring ball. Touted as rustic and simple yet popular with celebrities, my curiosity was piqued. Eschewing the fancy $65/per person New Zealand feast, we were grateful for the "free" wifi we paid ~$8 a cider for, as well as the plush leather couches. We wanted a weather report and had been out of wifi range and got it, plus a little email catch-up. 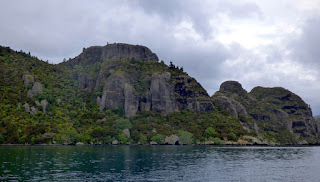 After ambling up the hill to take in the harbor's entrance and former gunnery point, we decided to push on to Whangaroa, anchoring near the marina. Whangaroa New Zealand at dusk. A very small town, but pretty. Locals at Whangaroa's pubs -- that's more what they were than restaurants -- looked askance when we asked what was fun to do in Whangaroa, or where there was a grocery store. We found out afterward there was a nice viewpoint walk above St. Paul's church we missed out on -- for once Wayne avoided getting dragged up a hill. The marina office was open only 2 hours a day. When I commented to a water-taxi tour guide about it, he said, "Yar, up here we're a bit more like them third world places. Like Tonga...." He recommended taking a 90 minute water taxi tour with Tony, for $56 NZ/person. "He knows all about the local history, and more...." A Kingfish Lodge guest we talked to raved about the tour. If we weren't feeling overly frugal, this struck me as probably a worthwhile splurge, especially for visitors short on time and wanting to make the most of their experience in understanding what Whangaroa has to offer. in the distance off the town of Whangaroa. If you're cruising to Whangaroa, come well provisioned -- the nearest regular grocer was said to be at least a 10 minute car ride away. I purchased some expensive garlic at the small general store, and a day later discovered it was already rotted. The tomatoes. fortunately, were better. Whangaroa appears to be fishing nirvana. Monstrously large trophy fish and photos provide the primary business decor. 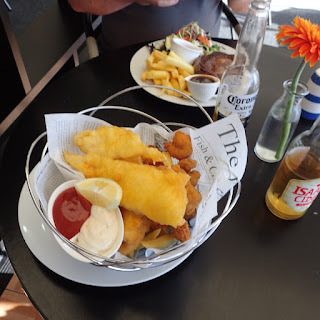 Whangaroa Fishing Club Cafe "seafood delight." "What would I use for bait here for something a little smaller than that?" I asked the fisherman credited with catching one of the whoppers -- a several hundred pound sailfish. "Anything. Just drop a hook and you'll get something. Cruising. While at anchor. 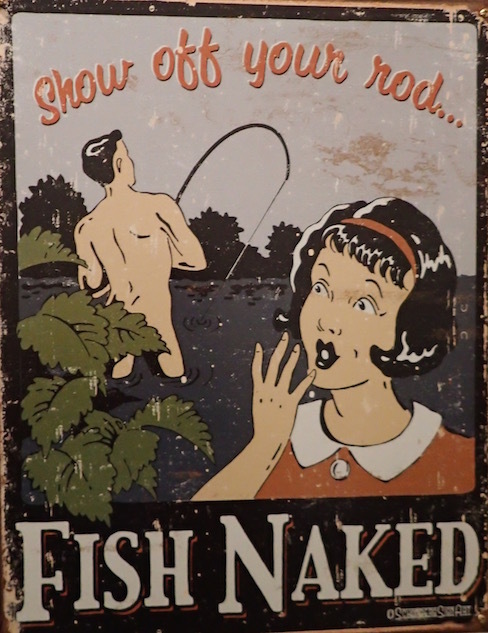 Better if you can use live bait, but if not, throw some bacon or something on the hook. All the fish here are edible." Thus I consumed probably 2,000 calories of them, a fried "seafood delight" at Whangaroa's local fishing club cafe, more intrigued by their fake newspaper wrapping article on "the weirdest ice cream flavors"* than imoressed with the meal. Ann Gates -- I am guessing I need to try again for the real deal on malty New Zealand fish and chips. *BTW - some of the weirdest ice cream flavors: horse flesh, cow tongue, oyster and squid top my list of the most conceptually disgusting (from this USA Today article). the purplish light, given the right timing. Indeed, as we re-anchored in Rere Bay, we saw plenty of fish even in the uber shallow inlet we dinghied up with the tidal flow. Dutifully, back at the boat, I dropped my hook with a bit of cooked chicken and left it. I may be the first cruiser to drop a line and not catch anything in Whangaroa. I know the fish were there. As Christmas approached, we decided to rejoin the Bay of Island hordes to celebrate Christmas with some other cruisers at Roberton (aka Motuarohia). 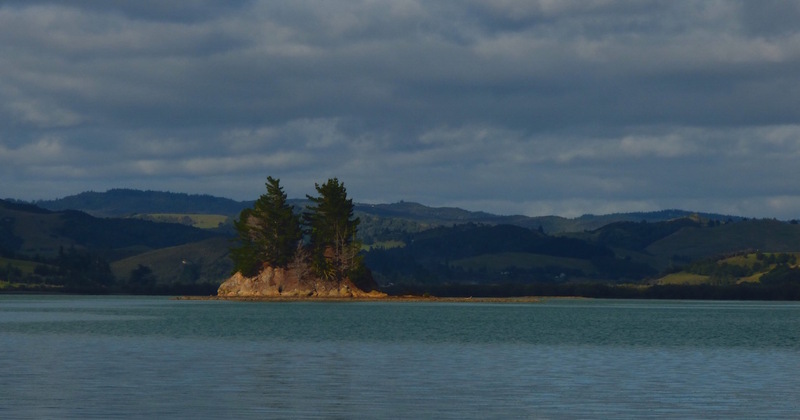 Truthfully, as beautiful as the Bay of Islands and Cavallis are, we're still feeling itchy for a little urban lifestyle for a while -- everything's in walking distance in Whangarei. 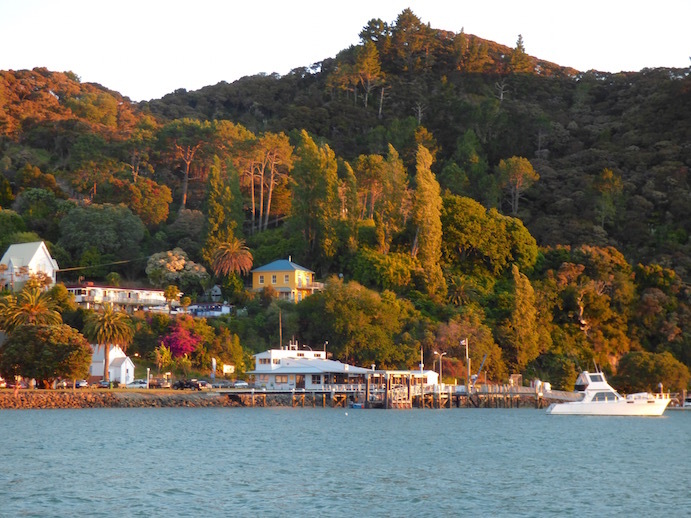 Rere Bay anchorage in dusk's golden glow. Whangaroa, New Zealand. This post is a catch-up post from December 21-24 2015 in the Whangaroa area North of New Zealand's Bay of Islands. We stopped at KingfishLodge (S35.00.745 E173.45.350), Whangaroa (S35.02.836 E173.44.514) and Rere Bay ( S35.00.524 E173.43.758). By the time this posts, we'll likely be in Whangarei, where our boat will stay for some time, while we do a little boat work and explore New Zealand over land. This post was written while tucked into Tutukaka Marina (S35.36.622 E174.31.668), for protection from this New Year's gales.